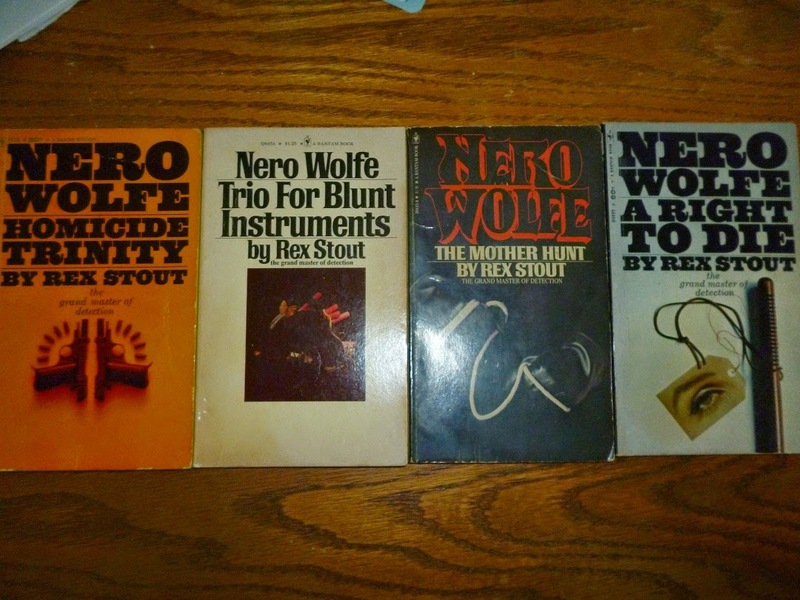 This is the eighth installment of the Nero Wolfe Project. This time, we're reviewing Homicide Trinity, Gambit, The Mother Hunt, Trio For Blunt Instruments, and A Right To Die. Homicide Trinity includes Eeny Meeny Murder Mo, Death of a Demon, and Counterfeit for Murder. I'll say it right now so I don't have to repeat it three times: These are horrible titles. In Eeny Meeny Murder Mo (ugh), a young woman who works for a law firm comes without appointment to see Wolfe. Wolfe, upstairs in the plant rooms, had previous gotten a stain on his tie and had left it on his desk. When Archie went to consult with Wolfe about the case--a divorce case where the prospective client had seen the opposite side with one of their own lawyers, and was going to hire Wolfe to investigate this breach of ethics--Wolfe declines, as he doesn't touch divorces. When Archie goes back downstairs, the client is dead, strangled with Wolfe's necktie. Wolfe, angered that his own tie was used to murder someone in his own office, takes to find the murderer out of spite. The mystery itself is interesting, although the resolution is somewhat pedestrian. In Death of a Demon, a woman arrives at Wolfe's office simply to hand him a gun--she wants to kill her husband, but knows it's not right, so hires Wolfe to basically take the gun away from her and inform the police if asked. Of course, while there, it turns out that her husband is murdered, and she is already a suspect. While in jail, she sends a note to Archie authorizing him to enter her house and get a specific box--it turns out the victim was not a great person and had many enemies--but when Archie arrives there are a group of people already searching the house illegally. Again, this is a well-constructed and interesting story, but the climax is a letdown. Counterfeit for Murder involves a big wad of funny money--which, of course, eventually leads to a murder. The story begins with an older eccentric who hates cops, coming to Wolfe to stick it to them, but eventually devolves into a standard mystery. Again, this story suffers from being a short story; while the run-up is humorous and provides some good writing and banter, the climax is mostly routine. It's still a fun read, though. Gambit takes a look at the not-very-exciting world of chess. The Gambit Club, where influential people take chess very seriously, had recently invited a gimmick-driven showman to play several games "blind." TO do this, of course, required a certain number of messengers and--wouldn't you know it--he ends up dead. The messengers are all put under suspicion, and it's clear that at least one of them was framed and, most likely, was the true victim. A pretty decent story, although the "chess" angle is not really played up to its full potential. Still, there's a lot of excellent repartee between Wolfe, Archie, the clients, and even Fritz, who at one point is required to take over for Archie (!). As is the pattern, the motive for the murder is kinda lame, but it doesn't really matter in the end. During The Mother Hunt we are treated to Wolfe and Archie trying to solve a maternity suit decades before DNA evidence. When a widow finds a newborn on her vestibule--marked that her late husband was the father--she hires Wolfe to find the mother. In the course of doing so, Archie sets in motion a cascade of events that result in two different murders. With the help of some fake evidence, a trip to Arizona for Fred Durkin (and Florida for Saul), and a baby carriage hooked up with a camera, Wolfe not only finds the mother but also the murderer. This is an interesting tale, unencumbered with the usual artificial ploys endemic to many of Stout's mysteries. It's also a good display of what happens when Wolfe's plans don't work out--the first few ploys completely burn out and Wolfe is left trying nearly anything to solve the case. Trio For Blunt Instruments includes Kill Now, Pay Later; Murder is Corny, and Blood Will Tell. In Kill Now, Pay Later, when Wolfe and Archie's shoeshine man comes to them, telling them of the death of a former client, Wolfe instructs him to go back to the scene of the crime and tell the police. The next day, his daughter approaches Wolfe; her father has been killed, presumably because he saw something he shouldn't. Since it's apparent she is also in danger, she beds down in the brownstone. When it's clear that the motive for the victim sullies the reputation of the daughter, Wolfe encourages her to file a slander suit. This ruffles enough feathers to get the suspects roiling, and a last bit of hard evidence seals the deal. While this is a nice story, it does bother me that Wolfe has his client sue Inspector Cramer--even if it is clearly a ruse, it just seems wildly out of character for someone that Wolfe has a begrudging but real respect for. Murder Is Corny has a horrible title, but otherwise is surprisingly good. When Wolfe's supplier of corn is disrupted (and the helper murdered) Wolfe is coaxed into finding out why. (It doesn't help that a suspect lied about Archie was to give her an alibi, and Wolfe is resentful that Archie's dalliances with women has caused him grief.) A solid mystery, not only because the standard jilted-lover angle is played with amusingly, but the entire point of Wolfe getting riled up because of his corn is fantastic. Blood Will Tell involves a mysterious package that was sent to Archie, a necktie with a blood stain. He then gets a call from the person who sent it to burn it, as he's changed his mind about whatever he had in mind. Archie, smelling something suspicious, soon gets wrapped up in a murder. A decent, brilliantly described story that relies on hard evidence. Books written during the civil rights era are tricky: they can either be jarringly blunt (with their outdated terminology and carefully moderated positions that look awkward in retrospect) or they can be mealy-mouthed and overly sympathetic. Stout somehow manages to balance all of these remarkably well. While the phrasing is still a little dated, Wolfe clearly comes across as progressive for the time while also lobbing valid criticisms at the civil rights movement; Archie, meanwhile, makes mains to show he's not racist while not losing his sense of humor about the entire ordeal (and even has eyes for a fair young black lady, which he needles Wolfe about frequently). It doesn't descend into heavy-handed polemics; it paints the civil rights movement as needed and right if occasionally flawed; it presents a wide range of attitudes, from the idealistic sympathizers to the realistic to the outright racist; manages to take a serious issue and still inject humor; and it somehow manages to weave a nice, solid mystery that makes sense, incorporates race while not being about race, all framed in an amazingly tasteful way. It's certainly not perfect, and modern audiences may still feel a little awkward at times, but it manages to still be one of his better novels.